Devon and Cornwall Police are growing "increasingly concerned" for the welfare of a 94-year-old man from Porthleven. Officers say Norman Stephens has been missing from his home since this morning. He is described as a white male who has short grey hair and may be wearing a long beige padded coat with pyjama bottoms and blue slippers. Police say Mr Stephens walks with a wheeled frame. No-one was hurt after a fire broke out in the celebrity chef's Cornwall restaurant in the early hours of Monday morning. A campaign has begun to save one of the West Country's most prominent landmarks. With its position at the end of the harbour, Porthleven's Bickford-Smith Institute is often photographed, especially when the weather takes a turn for the worse. Porthleven Town Council that own the building says it needs a major overhaul. It's going to hold an open day to ask the public for their views on the building's future. It's thought to renovate and maintain will total cost will be in the region of half a million pounds. The Open Day will take place on March 26th. Marine scientists from Plymouth say last year's winter storms were more violent than anything previously recorded. They've estimated that the impact of the waves along the Cornish coast was literally 'ground shaking'. The small fishing village of Pothleven is celebrating a remarkable recovery one year on from the storm which sunk six fishing boats. The way in which the winter weather can change our shoreline has been illustrated once again this week. The casualty this time was the beach at Porthleven where a freak high tide moved vast amounts of sand, leaving nothing but rocks. That new landscape was short-lived though, as within days some of the sand has been moving back into place. The new landscape was short-lived though, as within days some of the sand has been moving back into place. We think this photo would have provided inspiration for Turner. 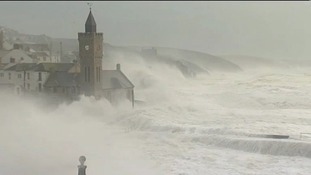 It was taken by our Gloucestershire correspondent Ken Goodwin, who's a bit out of his patch at Porthleven in Cornwall. The legacy of the winter storms continues to be felt right across our region with many communities still struggling to get back to normal - and in many cases rebuild their shattered livelihoods. And none more so than the Cornish fishing village of Porthleven. Repairs are continuing to the picturesque harbour there, while many of the fishermen have only recently got back to sea. Our Cornwall correspondent Steve Hardy has been to meet some of them.